Best Collections of Ads Ready Free Blogger Templates. 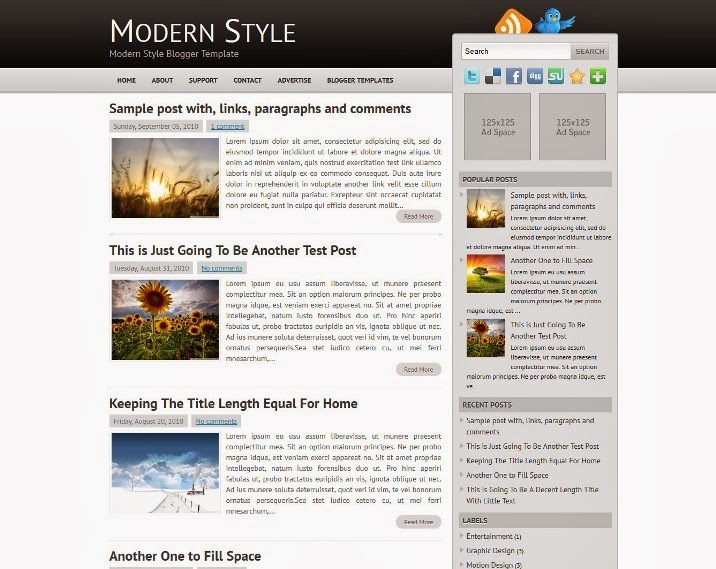 Modern Style is a free blogger magazine template with 1 Sidebar, 2 Columns, Adapted from WordPress, Fixed width, Fresh, Grey, Right Sidebar, Rounded corners, Top Navigation Bar, Web 2.0, White. 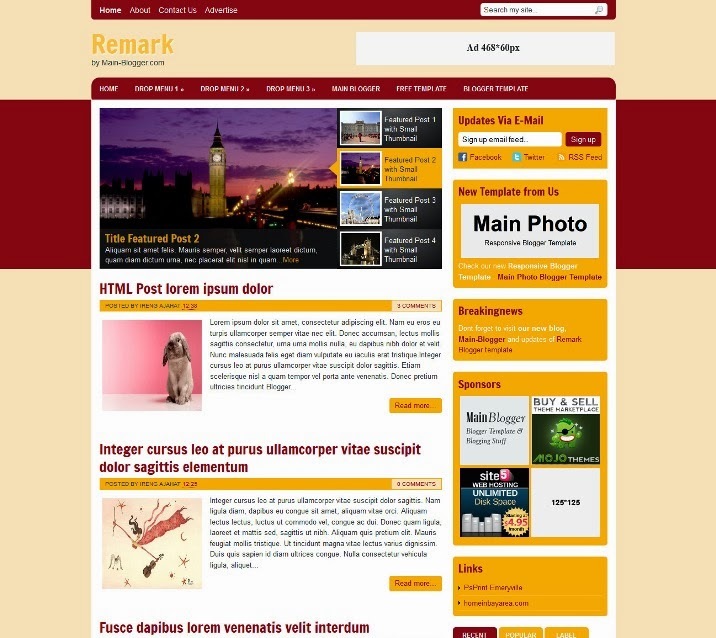 Free Remark Blogger Template is a free magazine style blogger template with rare color background. It’s a 2 column blogger template with right sidebar, 3 column footer, automatic featured content, ads ready, tabview ready, email feed sign up, social widget ready, dropdown menu, summary post, and more. 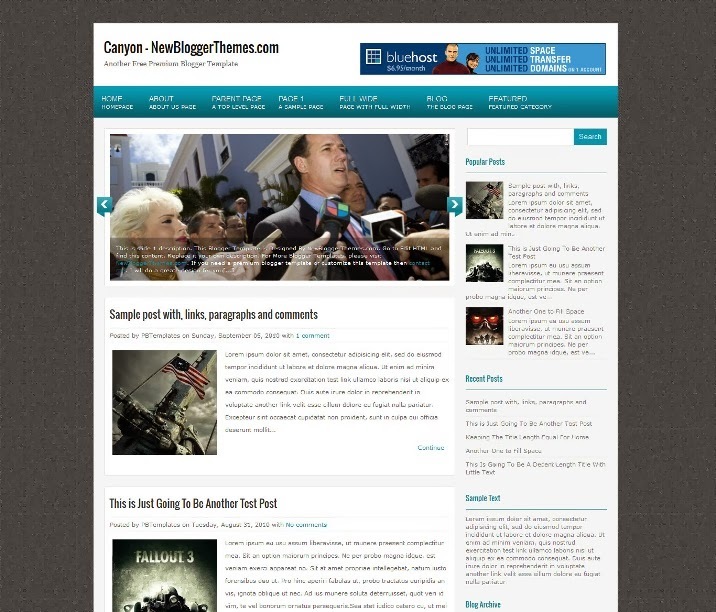 This template designed for all type of blogs. 2 Sidebar, 3 Column, 3 Column footer, Adapted from WordPress, Blue, Elegant, Featured Section, Fixed width, Fresh, Header Banner, Magazine, Premium, Right Sidebar, Slider, Tabbed widget, Top Navigation Bar, Web 2.0, White. 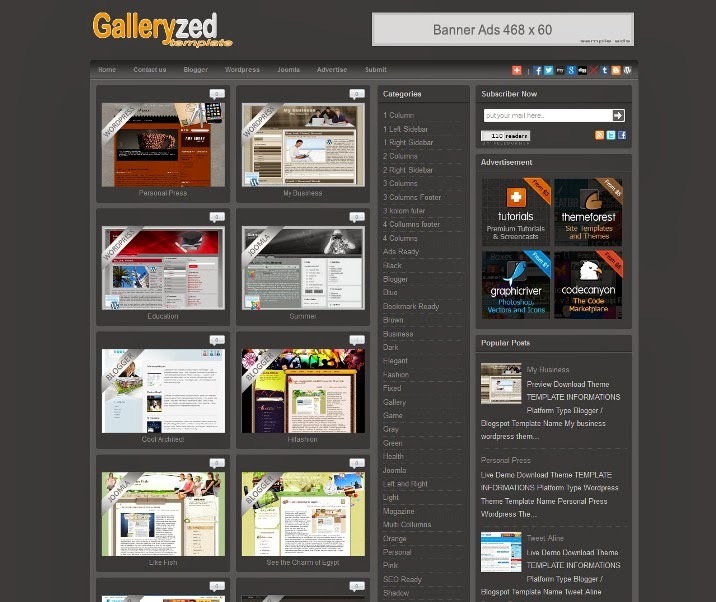 Galleryzed is a Premium Blogger template with post gallery style auto thumbnail on homepage. 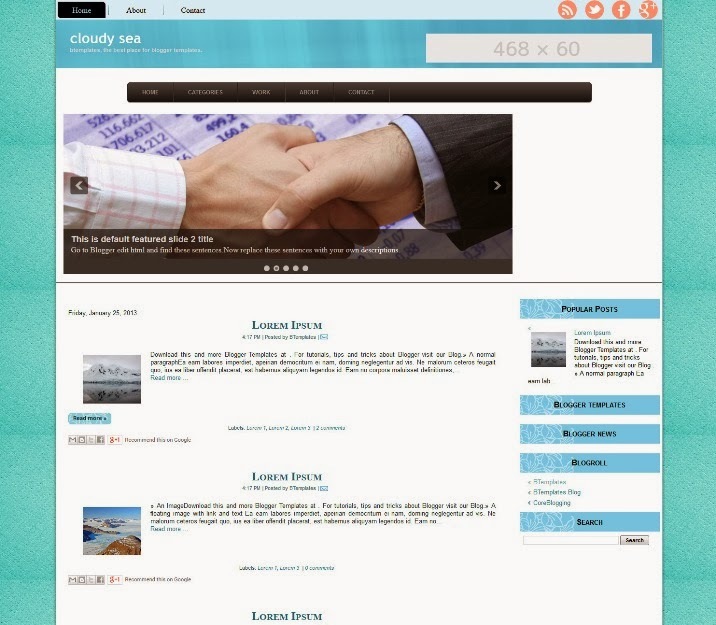 I recommended use this template if you want to build site Templates service or gallery site. Galleryzed Feature is auto resize image on single post and post, support download and demo button, fast loading page, gallery style on homepage, auto display icon labels on post you want, support Facebook Like, Google Plus and Social Bookmark ready, support Related Post With Thumbnail, ads ready, numbered page navigation and more. 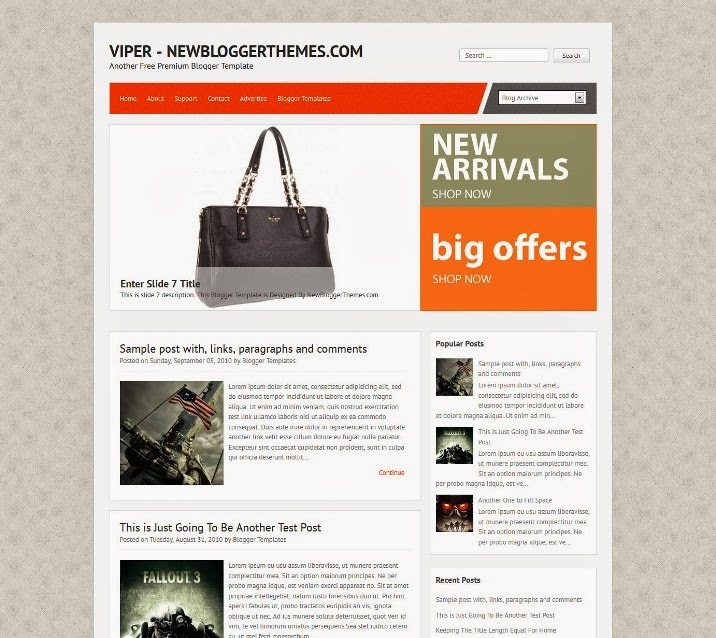 Viper free blogger magazine template. 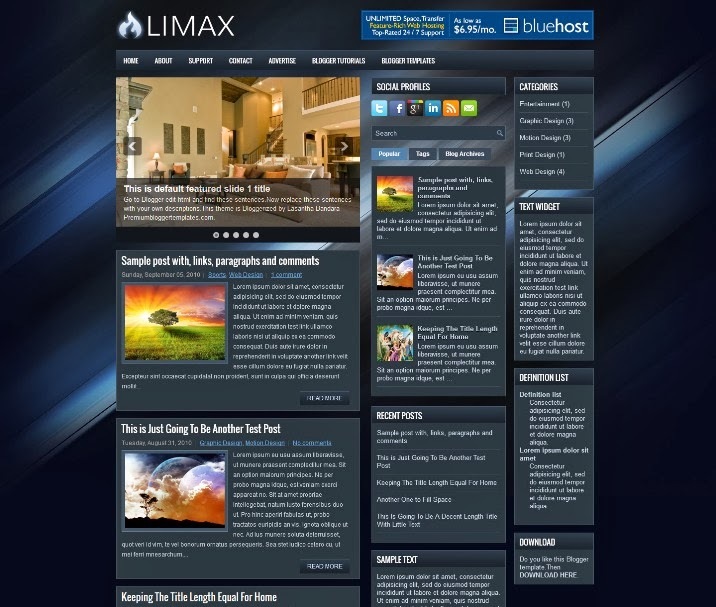 Features are 1 Sidebar, 2 Columns, 4 Column Footer, Adapted from WordPress, Featured Section, Fixed width, Magazine, Right Sidebar, Slider, Top Navigation Bar, Web 2.0, and more. 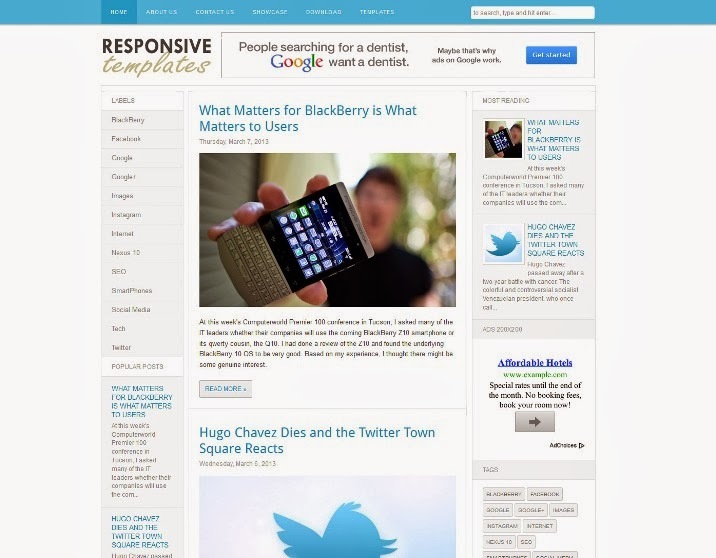 Media Online blogger template is a magazine style with auto recent posts per categories. 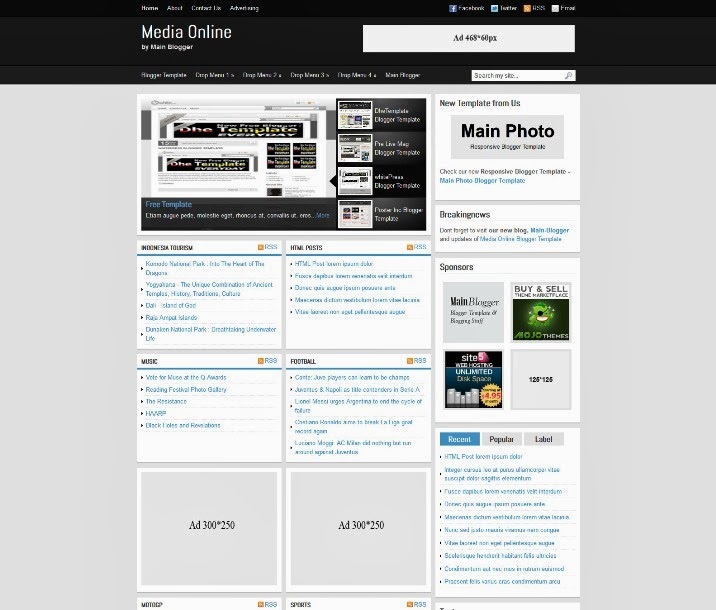 This template designed for news blog.Media Online is a free blogger template custom design with 1 Right Sidebar, 3 Column, Ads Ready, Black, Blogger, Bookmark Ready, Custom Navbar, Fixed, Gallery, Gray, Magazine, Slideshow, White and more. Canyon is a free blogger magazine template with 1 Sidebar, 2 Columns, 4 Column Footer, Adapted from WordPress, Blue, Brown, Elegant, Featured Section, Fixed width, Fresh, Grey, Header Banner, Magazine, Right Sidebar, Slider, Top Navigation Bar, Web 2.0, White. 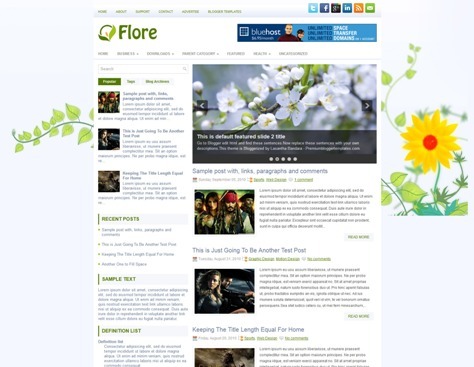 Flore is a free blogger template with 1 Sidebar, 2 Column, 3 Column footer, Adapted from WordPress, Elegant, Featured Section, Fixed width, Fresh, Green, Header Banner, Left Sidebar, Magazine, Nature, Premium, Slider, Tabbed widget, Top Navigation Bar, Web 2.0, White and more. 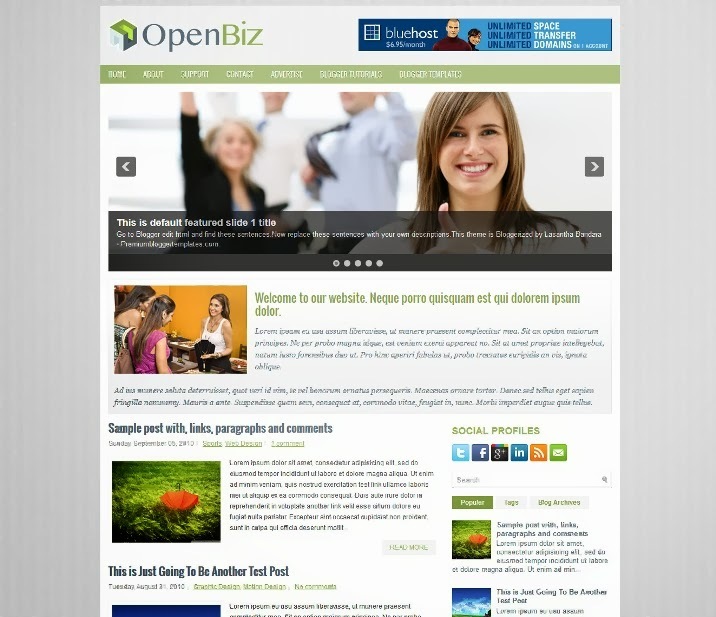 OpenBiz is a free blogger template for Business. Features are 1 Sidebar, 2 Column, Adapted from WordPress, Elegant, Featured Section, Fixed width, Header Banner, Magazine, Right Sidebar, Slider, Tabbed widget, Top Navigation Bar, Web 2.0, White and more. Cloudy Sea is a free blogger template with 2 columns, right sidebar, exclusive design for Blogger, ads ready, slideshow, social bookmarking icons, posts thumbnails, drop down menu and gradients. 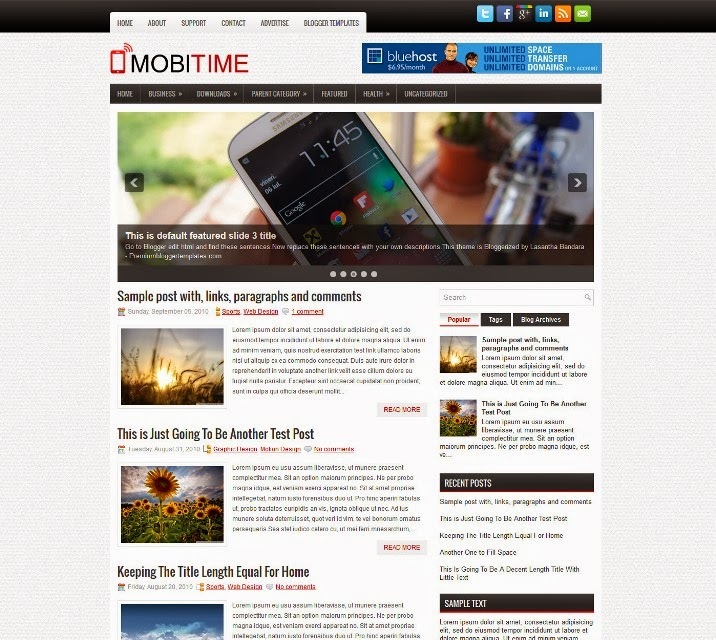 MobiTime is a free blogger magazine template. Features are 1 Sidebar, 2 Column, 3 Column footer, Adapted from WordPress, Black, Elegant, Featured Section, Fixed width, Fresh, Header Banner, Premium, Red, Right Sidebar, Slider, Tabbed widget, Top Navigation Bar, Web 2.0, White, Mobile.